I'm definitely moving forward, both literally and figuratively. 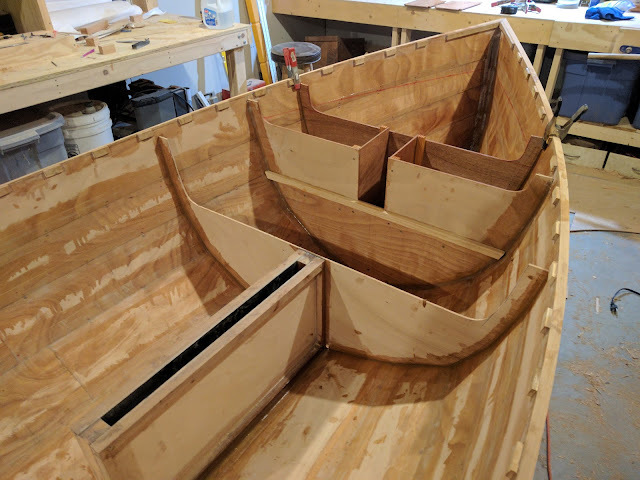 Figuratively in the sense that I feel like I'm getting a good amount of work done with minimal screw ups, and literally, because I am literally working on the forward section of the boat. I think I said in the last post that I am going rogue on the interior build from here on out. I'm still referring to the plans here and there, but not in any measurable way. 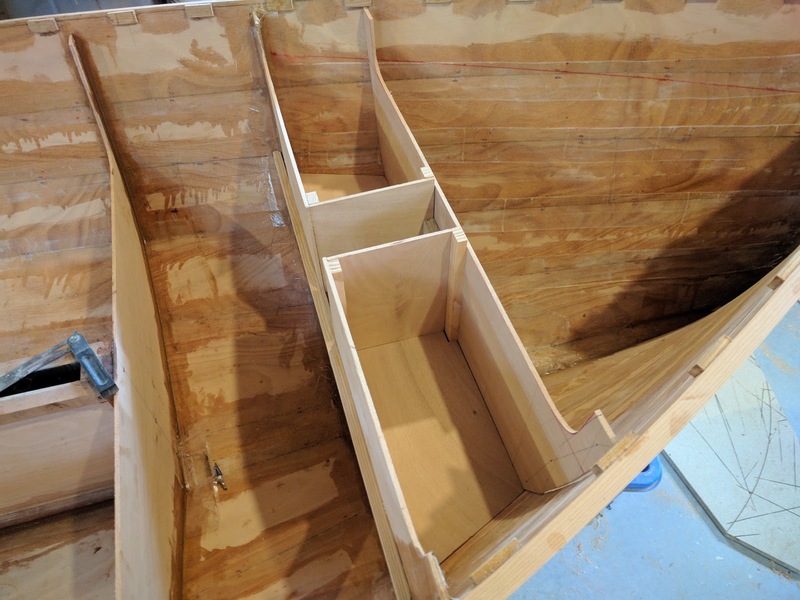 I'm winging it and starting with how things are arranged and built forward of the daggerboard trunk. I still have to abide by physics though, and need to distribute loads from the trunk and mast step, so I started with the idea that I would build a seat/storage compartment between the daggerboard trunk and the mast step to help tie things together. 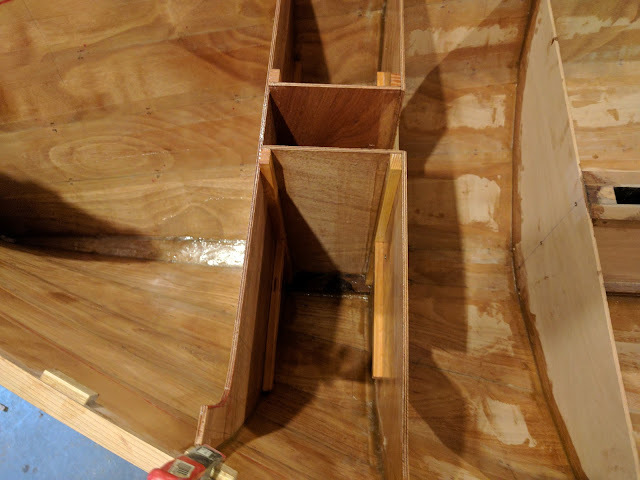 Since the forward end of the daggerboard trunk didn't land on a specified frame, I broke out the hot glue gun and made a template of the new frame shape with little sticks glued to a 2x4. Once completed I transferred the template to a sheet of plywood and cut it out on the bandsaw. The first fitting was tolerable and a few hits with the shinto rasp made the new frame sit just about perfect. 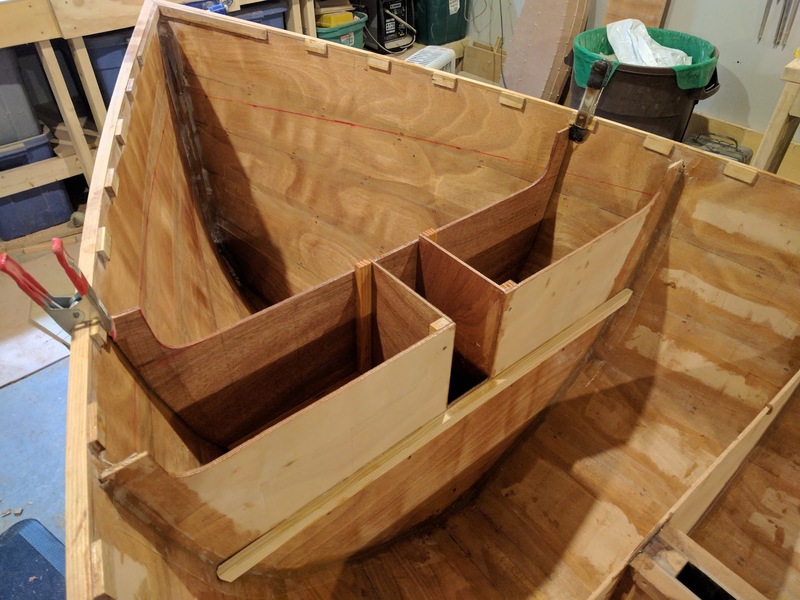 Moving on, I cut and fitted frame 11 which will sit about 200 mm forward of the frame 10 and will be part of the sandwich that makes up the mast step and partners. 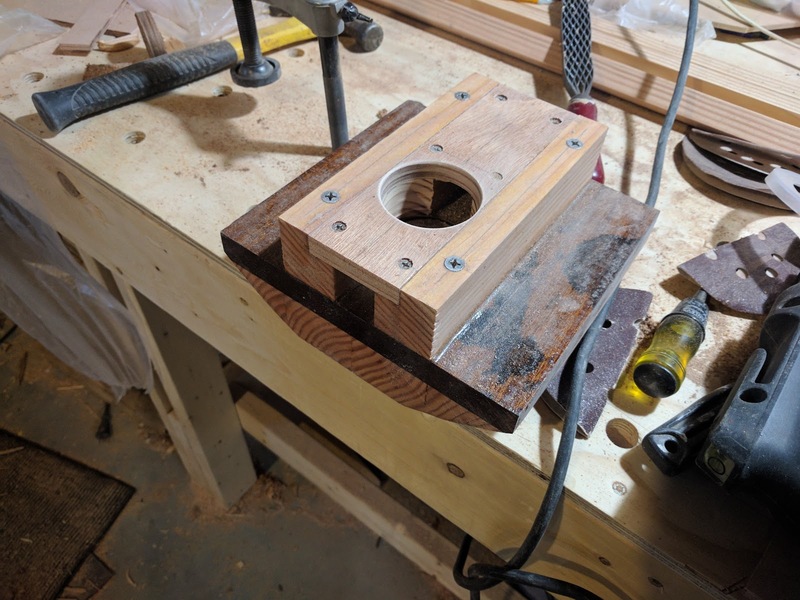 For the mast step, I glued up a big blank consisting of sapelle and douglas fir. 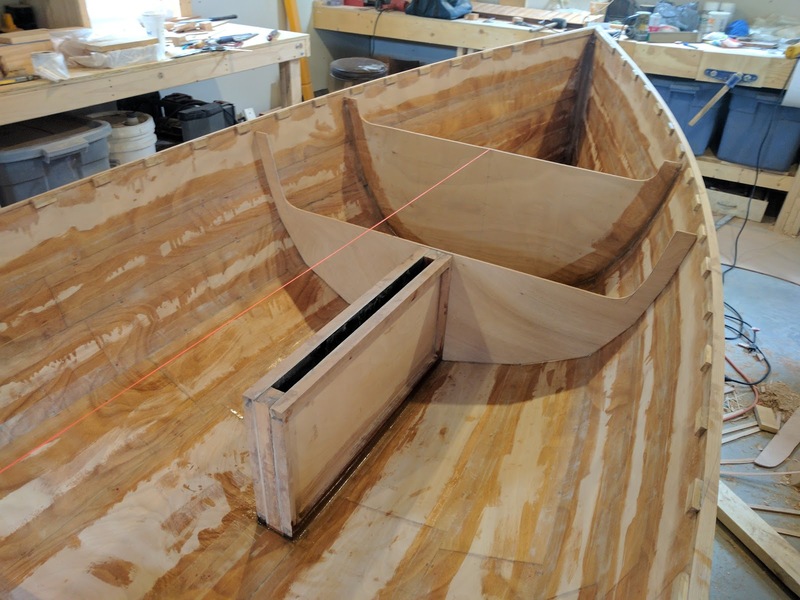 Once it cured, I shaped the bottom to fit the curve/angle of the boat and screwed and glued more douglas fir and a 12 mm piece of plywood rabbetted to the fir for the actual step. This will allow a channel for drainage underneath where the mast fits. A bit hard to verbalize, so see the picture to make sense of what I said. 'contemplation mode' to make sure I could visualize everything needed to be done. Once I was satisfied with all of my dry fits, I filleted in frame 11 along with the all the douglas fir backing pieces and after an initial cure, I hot coated everything with unthickened epoxy. The next day I glued in the fore and aft side pieces to complete the mast step sandwich. 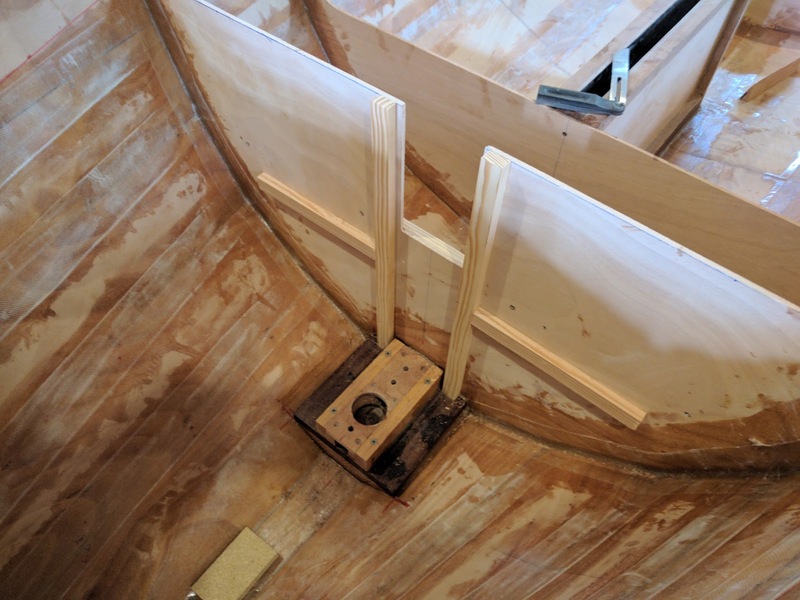 In the meantime, I cut out some plywood that will be mounted about halfway up the mast step on either side. 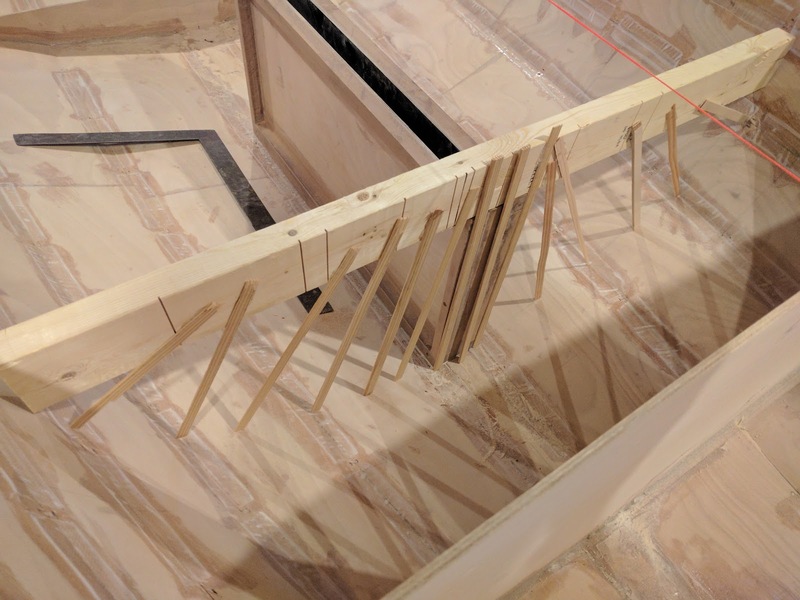 These will be glassed in and will serve 2 purposes: 1. they will be a shelf accessible through the bulkhead from the aft end, and 2. the area underneath them will serve as one of the watertight buoyancy chambers.